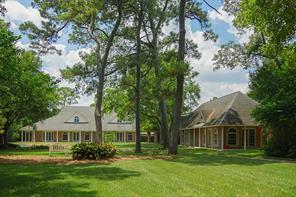 Stunning 5 Bedroom, 5.2 Bathroom with Pool on 3.5 acres. Upon entering the grand foyer, you are greeted by a wood paneled Library, formal dining room, formal living room, and sweeping staircase. The chef's kitchen with island opens to the breakfast room and den. As you enter the first floor master retreat, you're instantly drawn to the wall of windows overlooking the expansive grounds and pool. A private home office and two large custom closets lead into the bathroom with jetted tub, walk-in shower, and sauna. Continuing to the second floor, an over-sized central game room, leads to a covered terrace. Off of the game room, you will find a private media room and a computer/craft room. The second floor includes a second master suite, accessed by the elevator or the sweeping staircase. In addition, the second floor features three more bedrooms. 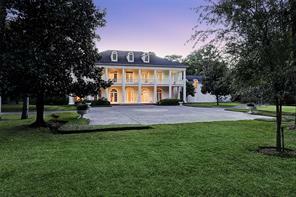 The three-car garage, porte cochere, and circular drive complete this impressive home. 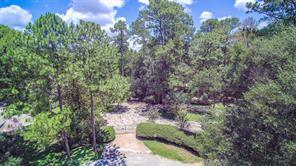 Gorgeous gated estate on wooded acreage. 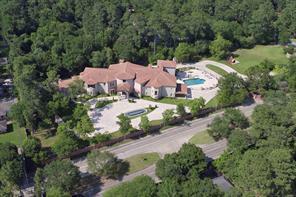 Lovely drive opens to view of grounds with beautiful home, guest house and pool. Enter to a high-ceiling great room with cozy fireplace and large bar perfect for entertaining. Open kitchen is configured for entertaining with rear access for caterer or event support. Two large elegant ballrooms with reinforced wood floors are ideal for the art or automobile collector, dance studio, media room, event space or reconfigured for daily living. Upstairs find a spacious master suite with balcony and bath, two additional bedrooms or study, a loft overlooking great room, and ample closet and attic storage. The guest house is a separate, fully appointed home and can also double as a pool house, game room or sunroom. Designed for flexibility and generational family living, this private, gated estate easily accommodates building additional structures. 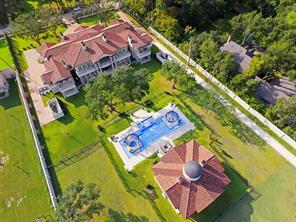 The expansive grounds are ideal for horse owners, animal lovers and tennis aficionados. Never flooded. 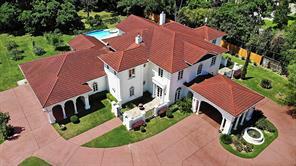 Exquisitely designed home by Roger Rasbach with a traditional flair on 3+ manicured acres* in Rivercrest. Gorgeous hand-hewn beams, 11’ ceilings, beautiful slate and wood floors. Theatre is downstairs with 8 reclining seats to view your favorite movie or sporting event. Master is a true retreat with spa-like bath, separate shower and a 20’ X 19’ master closet. Study is adjacent with custom built-ins, bar, storage closet & doors leading to patio/side yard. Kitchen and den are open to each other. Kitchen features granite counters, stainless steel appliances, huge island, butler’s pantry and built-in refrigerator. Additional two generous-sized bedrooms are down both with ensuite baths and walk-in closets. Upstairs are two more generous-sized bedrooms, Jack and Jill bath and exercise room. Don’t miss the resort-style pool with rock waterfalls, slide and firepit. Perfect property for horse lovers with plenty of yard to run and train – two horse stables with adjacent tack room and storage.